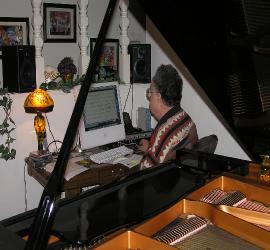 PianoMania Music started in 1989. Our goal was and is, to provide you with the best sounding recordings from the finest Ragtime, Jazz and early Blues pianists performing today. We started out in Roseville, CA before moving to our current location in Rocklin. Both towns are near Sacramento in Northern California. 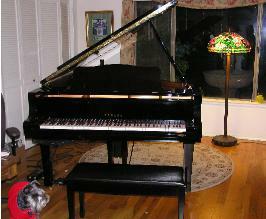 Our current recording piano is a state of the art Yamaha C-6 (6' 11") "Pro" series MkIV Disklavier Grand Piano. Recording is done on an iMac computer using Logic for recording and midi editing. Our digital audio interface is an Apogee Quartet which features outstanding microphone preamps and mastering grade converters. We spend many hours experimenting with different recording techniques to achieve the best recorded piano sound possible. Much help has been received from Paul Cantrell of innig.net on microphones/placement and mixing. Pauls site has some wonderful classical piano recordings which are available for download.